My mum phoned me from an auction house a month or so ago, as she’d found something too good to miss. While she appreciates midcentury furniture’s curves, she isn’t too keen on putting it in her own home as to her it’s a twee reminder of a 1950/60s childhood. I spent the next half hour doing some web research to find out how much one should expect to pay for a Ercol studio couch in good nick. And here she is, for £350. 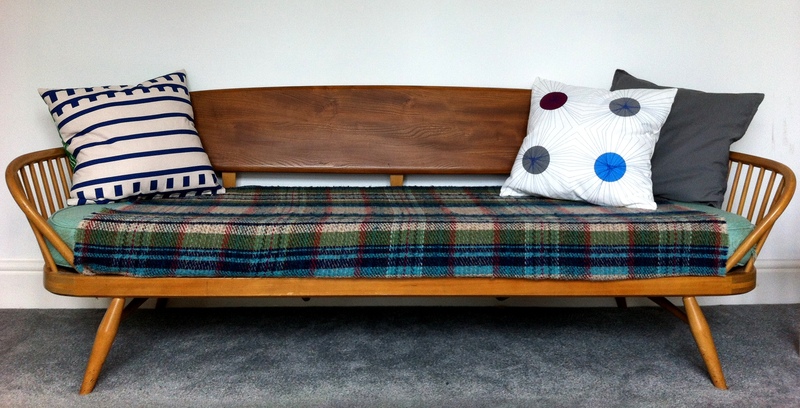 She needs a new mattress, but for now the old faithful Tweedmill blanket and some new Ikea cushions will perk her up. Working from home writing day-in, day-out results in one or two coffee breaks. This afternoon I took five in the garden in the light spring rain, accompanied by the poultry shears, hastily grabbed from the kitchen. We are slowly building the garden, investing in perennials and shrubs that will last years, and therefore have very little in the way of well-established vase-worthy flora. I long for the day I can cut a few branches of apple blossom or a bunch of tulips to bring indoors. In the meantime, I’ve snipped a few sprigs of flowering rosemary and some foliage to brighten up the mantel and bring life to the pink chevron jug that arrived this morning courtesy of Ebay. 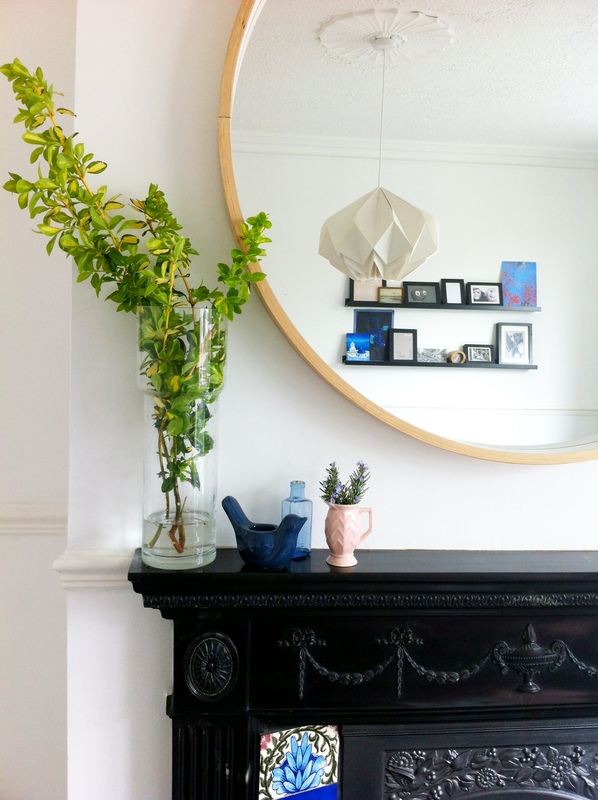 You might notice the round mirror that is a relatively new addition, also from Ebay, and something I had spent months looking for at the right price (in this case £30). I still need to stain it to match the rest of the furniture in the room.